Paul Hanlon is excited by the prospect of teaming up with two players he has found to be pesky opponents in the past. 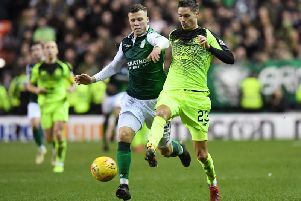 James Keatings and Dan Carmichael are the only new faces to have joined Hibs’ ranks so far this close-season and Hanlon is delighted that he will be on the same side as them from now on instead of trying to stop them causing havoc. The defender has come up against the former Hearts striker and the ex-Queen of the South maverick in recent seasons and knows from experience that both will add to Hibs’ threat in the final third. “It’s two exciting signings and I’m sure the fans feel the exact same,” said Hanlon. “I’d certainly rather the two of them were on my side than playing against them. James Keatings’ record speaks for itself at Hearts. He found himself out of the team a lot but still had a great scoring record so I’m really excited about him signing. I was surprised James was allowed to leave Hearts but hopefully he can bang in the goals for us. It doesn’t matter he’s come from Hearts – he can score goals and that’s what matters. “A lot of times last season we dominated games and it was the fine margin of putting the ball in the net. I think he only started one derby up front against me last season but he’s lively and works hard. He’s a pest for defenders. He can play up himself and work a whole back four. “I don’t imagine it would be easy crossing the Edinburgh divide although I don’t know because I can’t imagine playing for Hearts. All it takes is a couple of goals for us and the Hibs fans will be right behind him, and I’m sure he’ll do that. Martin Boyle, a slightly more familiar face following his loan spell at Easter Road last season, has also signed a two-year deal with the club, adding to the sense of optimism building this summer. Hanlon believes the former Montrose and Dundee forward will give his team the injection of pace they lacked at times when he was injured for the play-off semi-final defeat by Rangers last month. Rangers, who have been installed as bookmakers’ favourites to win the Championship, only appointed their new management team of Mark Warburton last week, and Hanlon is hopeful that Hibs can steal a march on their title rivals. The defender recalls only too well how a summer of flux – Stubbs wasn’t appointed until 24 June – wreaked havoc on his own team’s title hopes last year. “I’m not surprised the bookies have made Rangers favourites but it doesn’t mean anything,” he said. “It was the same last season and Hearts ran away with it. We won’t pay attention to the odds. We want to hit the ground running. At the start of last season we were in a bit of a mess. We had hardly any players and the manager was trying to put a squad together and it took a while to really get going. “We all bought into the manager’s ideas and loved the way he was wanting us to play right from the start. It was just the players getting to know each other which took time. It takes time to settle but coming into pre-season on Thursday there’s new players in who are ready to go from the start and we can all be on the same page ready to try and win promotion.